In one of Apple’s most unusual 5G developments to date, the company appears to have filed for a new 5G-related trademark in the Netherlands: “Apple Bald Eagle 5G,” specifically listed as being used for mobile telecommunications network services in Benelux. The trademark filing with Benelux’s Office for Intellectual Property (spotted by LetsGoDigital ) superficially appears to be legitimate, but is definitely odd. 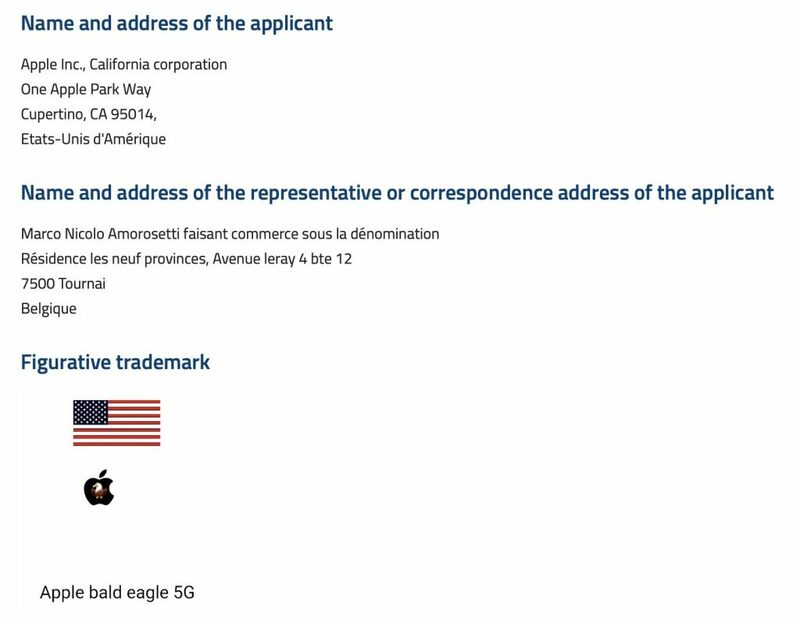 It lists Apple at its One Apple Park Way address as the applicant, and includes an accompanying “figurative trademark” of an American flag with a cartoony bald eagle inside an Apple logo — in no way Apple’s style. Filed under Class 38, the trademark would conceivably cover Apple offering mobile network service within Benelux, which includes Belgium, the Netherlands, and Luxembourg. While it’s hard to picture Apple launching its own 5G network within this area, particularly under that name, it’s possible that the company is actually preparing to conduct 5G testing in the region, or otherwise preparing 5G services under a placeholder name. If it wasn’t for Apple appearing as the applicant on the trademark filing, the idea would be easy to dismiss. Notably, Apple’s representative for the filing appears to be located at a residential building in Belgium, rather than at Apple’s own campus or a law office. Moreover, the name, the included graphics, and overtly American theme don’t match Apple’s branding standards. But the company has occasionally used local filers and/or deliberately misdirecting shell company names in the past to mask its purposes when doing certain IP-related transactions. The company famously registered the name “IP Application Development” to negotiate for iPad trademark rights without evoking the Apple name. By contrast, this filing appears to tie Apple’s name and 5G directly together (with America’s national bird, no less). Early 5G networks began to launch inlate 2018, and will continue to launch throughout the world in 2019 and 2020. Unlike competitors, Apple is not expected to release a 5G phone in 2019. It is believed to be testing 5G components in advance of a planned 5G device launch in 2020 using an Intel modem, and is reportedly working to develop its own 5G modem , as well. The Apple Bald Eagle 5G filing was made on February 3, 2019. It is currently under examination by the Benelux Office for Intellectual Property prior to becoming official.